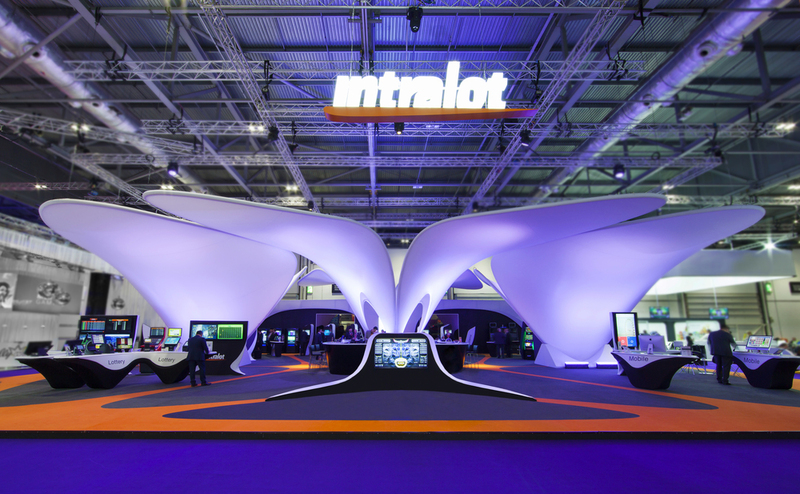 London Iconic Pavilion deals with the design and realization of a high-end portable pavilion able to travel the word and showcase technology and gaming context of Intralot, one of the top tech companies in the world. The architectural concept is to create an exciting and unique journey for the visitors, immersing them into an eye-catching and cutting edge spatial experience. We challenged the notion of portability and proposed this lightweight and daring piece of architecture, where engineering and infrastructure becomes design features and are incorporated into one single system. Thus the London Iconic Pavilion consists of 8 petals hovering above the ground and creating striking experiential atmosphere. Each petal is made from a sectional CNC-bent aluminum ring-beam and then dressed up with a lightweight stretched tailor-made fabric. It has an assembly concept where a small group of people can deploy it into a few hours and then dismount it, pack it and travel around the world. Working alongside BuroHappold Engineering, we achieved this innovative and challenging project, through the smart design of the petals, which is based on pure hyperbolic paraboloid mathematical geometries, while cantilevering almost 10m across the pavilion terrain, pushing the envelope of architecture, engineering and innovation. The design of the pavilion is based on the delineation and demarcation of a continuous dynamic space. The plot is carved by a designed journey and circulation paths. This pedestrian network engraves pockets of program, which accommodate exhibition areas. Each exhibition area is an area for innovation and technology. The subdivision of the pavilion is designed as well, for maximum flexibility, towards future scenarios of adaptation into various sites, reducing the footprint down from 8 petals to 4, or even only 2 for smaller venues, ensuring the longevity of the structure. The design process of the Iconic Pavilion incorporates the constant communication and feedback loop between digital and physical world. The material properties and other physical constrains become creative design tools, generating a pure, smart and cost-efficient structure where design, engineering and beauty blend into one single system. Simultaneously all elements, furniture or display-totems are designed to enhance the same idea of lightweight, flexible and dynamic experiential journey. The Iconic Pavilion premiered in London on February 2016 and it is now traveling around the world to Atlatna (NASPL 2016) and Singapore (WLS 2016) and it is planned to be used for at least 2 years and be installed around 10 times. London Iconic Pavilion represents a stellar example of high-end portable architecture, where paramount architectural qualities and innovative engineering, blend together into a challenging, original and unique outcome.